However Ukraine highly appreciates Berlin's peace efforts, including in the Normandy format. The Ukrainian Foreign Ministry on 7 February summoned German ambassador Ernst Reichel and let him know that elections on the occupied territory of Donbas cannot be held in the presence of the Russian occupation forces. "We have confirmed Ukraine's clear and consistent position that such elections should be held only after the units of the Russian armed forces leave Ukraine, and security prerequisites are put in place to ensure free and democratic elections in Donbas in accordance with the standards of the OSCE and Ukrainian law," the Foreign Ministry's statement reads. The Foreign Ministry said that Ukraine highly appreciates Berlin's efforts to restore peace in Donbas and stop the Russian aggression against Ukraine, including in the Normandy format. Earlier, Reichel said in an interview with RBC-Ukraine that elections in Donbas can be held even in the presence of Russian troops and that both sides are not delivering on the Minsk agreements. 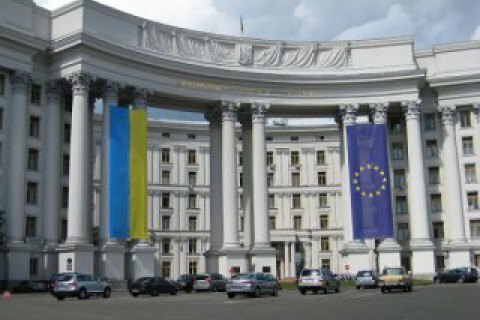 The Ukrainian parliamentary committee on foreign affairs condemned his remarks and suggested that tomorrow's reception at the German embassy on the occasion of the establishment of bilateral diplomatic relations should be boycotted.